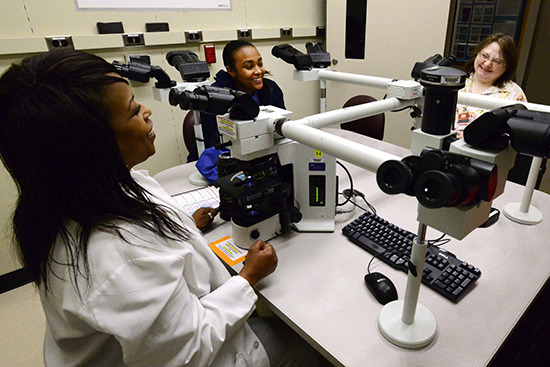 The National Toxicology Program (NTP) Pathology Support Group is providing state-of-the-art laboratory facilities and training to student researchers from the North Carolina Agricultural and Technical State University (N.C. A&T). Participants are learning the latest techniques for collecting, processing, sectioning, and staining biological samples. “They had been doing everything by hand and storing samples in the freezer, which reduced the quality of the samples for analysis,” said Natasha Clayton, supervisor of the laboratory and coordinator for the project. Each Friday, Sherrell Pettiford, a senior majoring in laboratory animal science, and Dawn Conklin, lab manager at the university, travel from Greensboro to Research Triangle Park, where they work with Clayton to learn manual and automated pathology procedures, including histology, clinical chemistry, and hematology. This training opportunity grew out of a project between Darlene Dixon, D.V.M., Ph.D., head of the NTP Molecular Pathogenesis Group, and Jenora Waterman, Ph.D., associate professor of functional genomics in the N.C. A&T’s Department of Animal Sciences. The project requires histopathology tissue evaluation, and Clayton and Ronald Herbert, D.V.M., Ph.D., head of the NTP Pathology Support Group, quickly recognized the value of training Pettiford and Conklin in the preparation of samples using NIEHS laboratory processing equipment, which is not available at the university. Pettiford’s study includes 20 pigs, half of which were housed indoors and half outdoors. 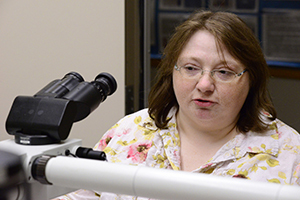 She is researching the respiratory effects of the housing environment by examining samples of the trachea, which is the windpipe that connects the pharynx and larynx to the lungs. 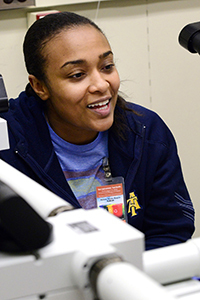 Supporting N.C. A&T is in-line with the NIEHS strategic plan goal of inspiring a diverse and well-trained cadre of scientists in the field of environmental health sciences. next article - "NIEHS will host IOM ..."